A tool known to us from early childhood is a hammer; in the view of many people it acts as a primitive tool of labor, which was used by primitive people. Of course, this is a historical fact. But he does not diminish the role of this ingeniously simple percussion device, which can be described with complete confidence as the most effective mechanism for the transformation of kinetic energy into mechanical work. Hammering a nail, we don’t think about the most complex physical transformations in the hammer / nail / solid system. The efficiency (the ratio of the useful work and the energy expended to bring the hammer into motion) is 70 - 97%. For most modern machines and mechanisms, this is an unattainable limit. matching the type of hammer the operation being performed. The last item on the list is very important - in machine building, stone processing, and construction, various types of hammers of different levels of versatility are used. Among them, you can choose a tool for all occasions, for domestic and semi-professional use, and highly specialized, "sharpened" for performing one or two operations, but with the highest efficiency. The two main parts that make up the hammer — the handle and the head — are tightly connected to each other. When moving on a massive head, sufficiently large forces act - when sliding off the handle during an impact, the kinetic energy of the head allows it to fly several tens of meters. If at the junction there is the slightest reel or there are cracks on the handle - it is absolutely impossible to use a hammer. It becomes dangerous for the worker and others. The striker, the head impact part, usually flat, has sufficient area and strength to withstand a significant amount of impact contacts with solid objects without deformation. The impact surface is flat or slightly convex. In cross section, it represents a square, rectangle, or circle. The back of the hammer is, in most cases, wedge-shaped. This allows you to develop a much greater impact force, by reducing the contact area. Impacts with a wedge are used when the material is cracked or chased. The back part can be spherical, depending on the application of the hammer and its main purpose. The rider is made in the form of an oval or round through-hole, the walls of which slightly expand from the center to the upper part, in order to exclude the possibility of slipping from the handle. On some types of hammers, there is a forging around the bore in the form of a metal collar that extends several centimeters into the upper part of the handle. 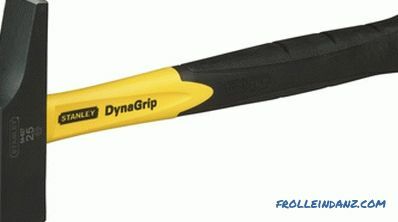 This part of the tool prevents the handle from kinking if the impact is too strong or inaccurate. The head is made of solid metal by the method of forging, casting or milling. 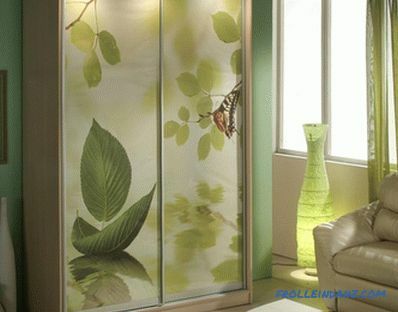 It is protected from corrosive effects by special types of paint or electroplated coating. Before applying a protective layer, the head is hardened, in most cases selective. The highest hardness (up to 52 units on the Rockwell scale) is reached by the impact part (peen). An electric induction hardening method is performed, which makes it possible to precisely control the depth of surface hardening. At the striker, the quenching depth reaches 3–5 mm. The back part (wedge or spout) is reinforced to 36 - 42, and the area of ​​the bore hole is only up to 24 - 30 units on the same scale. The shape, mass, dimensions and other characteristics of industrial-made hammers are determined by GOST 11042-90 and 2310-77 which describe almost all types of hammers and their purpose. Many manufacturers produce percussion instruments according to their own specifications, which take into account most of the requirements set forth in national standards. The changes relate to the use of new alloys, the length and shape of the arms of improved ergonomics, computer-modeled, more accurate surface treatment. Distinguished by its shape - the rear part is done in the form of a dovetail, a nail puller. 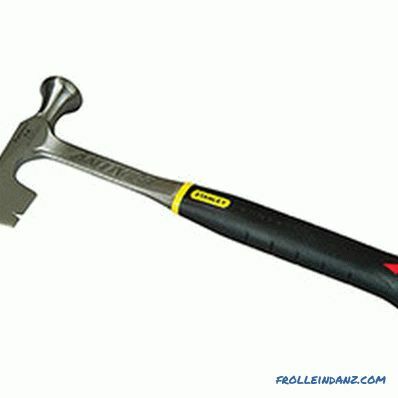 In most cases, the types of hammers and their application can be unmistakably determined by design. As a rule, they represent a double-action tool with which you can perform several heterogeneous operations without involving other devices. 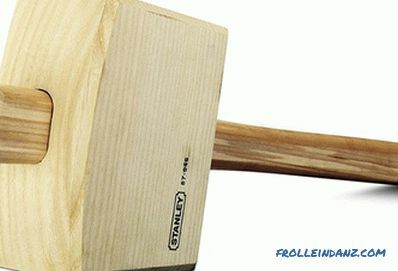 The mass of the carpenter's hammer is in the range of 300 to 800 grams. They are intended for hammering nails and wedges, fitting wooden mates. The working surface is smooth or grooved, flat, the back part, the nail puller has a different bend angle - from its complete absence to 100 - 120 0 (the so-called "Californian"). The first known image of a carpentry hammer of our usual type is dated 1514. You can see it in the painting by Durer "Melancholy". 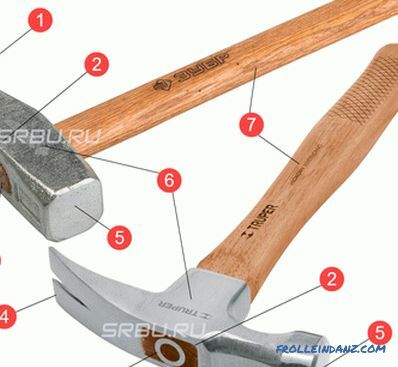 Carpenters' hammers are used in the assembly work of various bearing and auxiliary structures made of wood. Some varieties of tools have special slots on the head baiting parts g A shock or magnetized head holds the nail in the working position when working with one hand. 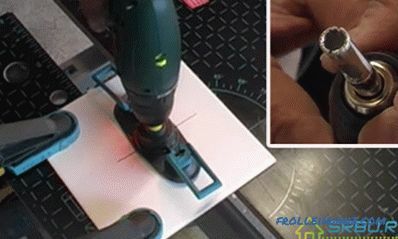 High precision tools. Not so much impact force is required here, how accurate. Produced in a wide range of head mass - from 100 to 800 grams in increments of 50 grams. The impact part in most cases is perfectly flat. The back part can be either a nail puller or a simple wedge. The handles are made not only of wood, there are metal and fiberglass, covered with rubber or polymer linings to prevent slipping hands. 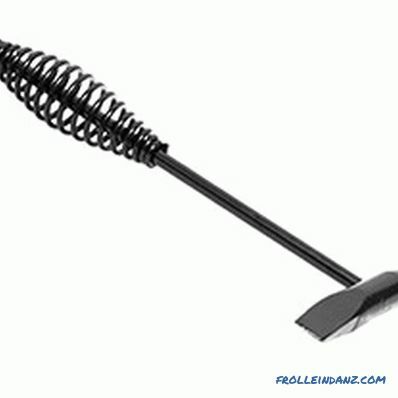 Very similar to joinery, but with a wedge-shaped rear part and a slightly bulging striker, tempered to 45 to 50 units, which prevents damage when striking a core or chisel. The mass range is the same as that of the joinery; the handles are also made from various materials, as a rule, are covered with oil-resistant linings. 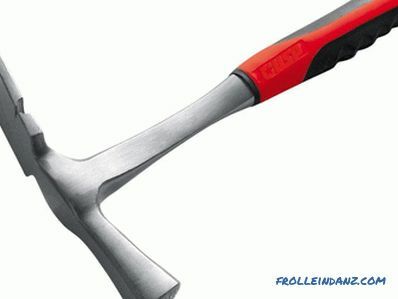 Under this name various types of hammers, distinctive the peculiarity of which is the presence of a flat impact part and a specific back, intended for cleaving and breaking brick and various stone and concrete materials. The rear part can be in the form of a flat or pointed pickaxe. On this basis the tool of the bricklayer is called Berlin or Geneva. Working with stone and ceramic materials requires increased hammer strength, so they are cemented or hardened by induction to a hardness not lower than that of a blacksmith the hammer. 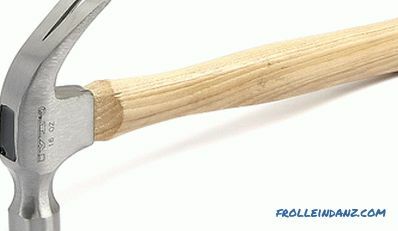 Among the universal tool can be distinguished hammers for applying a decorative notch. They are called "bouchard", they can be distinguished by the presence of various kinds of protrusions, bumps and cuts on the impact part. 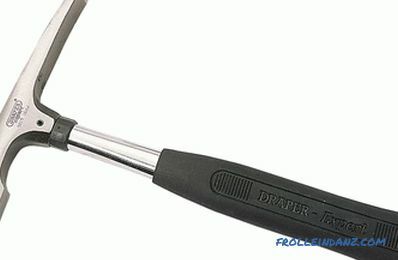 As in the sledgehammers, the handle of the mason's hammer is inserted from above and is not wedged. The handle is often marked in the form of a ruler, which facilitates the work of the bricklayer when fitting bricks for dressing or laying complex architectural elements. 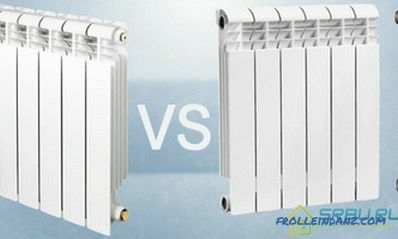 When installing ceramic tiles, large mechanical loads and impacts are not applied. As for carpentry, accuracy is more important. 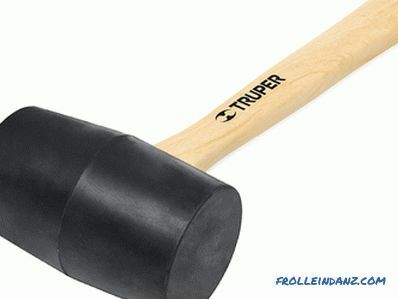 The weight of the hammer of the tiler rarely exceeds 75 grams, the shock part is hardened to high hardness. Such tools are used mainly for breaking off small parts of a tile when fitting to size. When using require accuracy and accuracy. Depending on the roofing material used, a tool with a steel or polymer beater is selected. The handle is usually wooden. Unlike leveling, also designed to work with sheet metal, the back of the hammer of the roofer is a pointed wedge, like a pickaxe. It serves for punching holes in the sheet and bending the folds and edges. 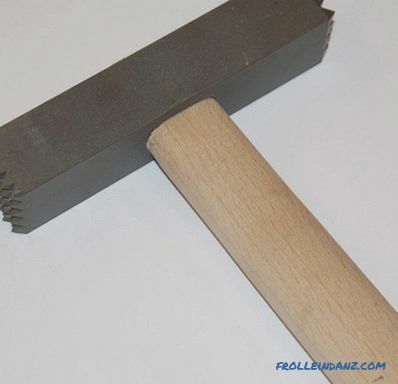 Hammers for mounting slate roofs are different from tools for metal - they are equipped with a wider striker for slate nails and a special shaped nail puller in the rear part . 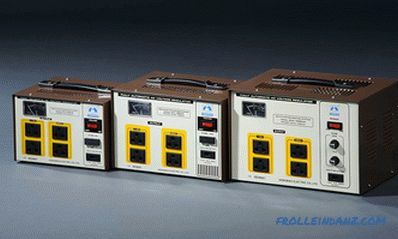 Intended for leveling deformed tin products, installing roofs, drainage systems and other operations with sheet metal. As a rule, they are made of rubber or polyurethane, but there are also models with a metal head, equipped with replaceable dies of a softer material. Among the leveling hammers, a non-spinning type of tool that does not rebound at all is popular.Such hammers are made with a hollow impact part, in which sand or small fraction is poured. They completely absorb the reciprocal energy of impact and the hammer "sticks" to the treated surface. Kiyanka designed for carpentry or plumbing (different types). They are made of solid wood, cast rubber or polymeric materials and are designed for leveling, leveling and fitting large parts, as well as for working with chisels, chisels, wedges, cutters. The impact part is a rectangular parallelepiped, the handle is wood or durable plastic, fiberglass, metal, usually of circular cross section. 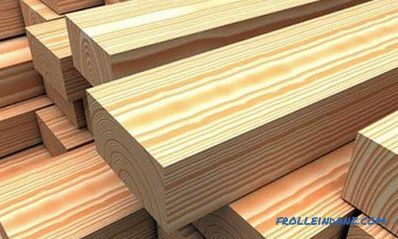 Carpenters can be cylindrical or barrel-shaped, while locksmiths can be equipped with a wedge-shaped back. For work requiring special delicacy, the hammer head may be supplemented with leather, plastic, rubber or rubber linings and nozzles. One of the most powerful tools is a sledgehammer - a massive tip with a long handle. Sledge hammers are used to perform various operations where a large impact force and low accuracy are required - crushing stones, concrete, blocking wedges and racks, forging for large parts. You can see the sledgehammers in Egyptian and Roman frescoes and paintings from the lives of builders. In some cases, sledgehammers were used as a powerful and effective weapon. As a rule, sledgehammers are a two-handed tool. But there are variations for one-handed operation in tight spaces. Production of sledgehammers GOST 11401-75 and 11402-75 is regulated. 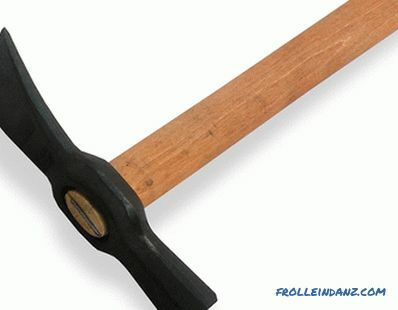 The weight of the working part of the sledge hammer is in the range of 8–10 kg, but it can reach up to 16 kg. 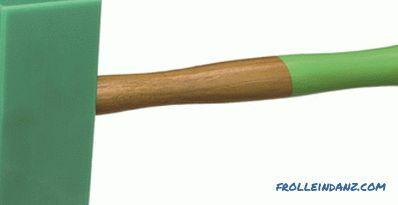 Sledge hammers are made by forging, followed by surface hardening up to 32 units. 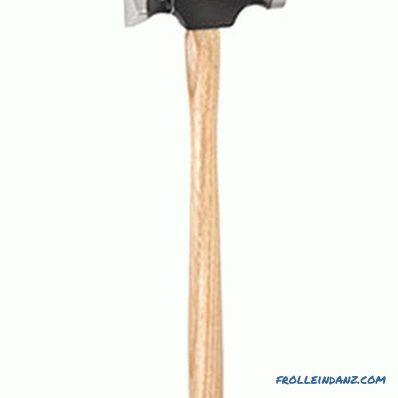 Blacksmith hammers are additionally equipped with steel linings on the impact part. 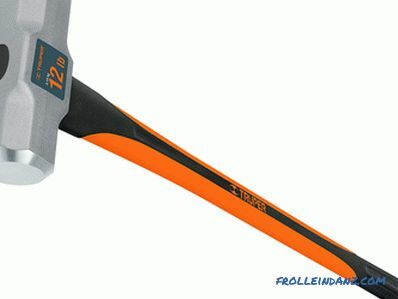 Small blacksmiths and construction sledgehammers with a head mass of up to 2 kg are hardened to 50 Rockwell units. The sledgehammer head itself is a rectangular parallelepiped or has the shape of a conventional hammer with a wedge-shaped back part. Wedge is located perpendicular or parallel to the longitudinal axis of the handle. The mounting hole of the sledge hammer and hammer is slightly tapered, narrowing towards the bottom. The handle is inserted from above and does not require wedging, as a result of this form of vsad, the sliding of the massive head is practically impossible. The length of the handle correlates with the mass of the head and can reach 120 cm (mostly 80 - 90 cm). In addition to these, there are also hammers of a very narrow scope, sometimes quite unusual. The Kashkarov hammer, the most accurate of all. The strength of concrete is determined by comparing the depth of the track on the concrete and the control metal plate inserted from the opposite side of the striker. The accuracy of determination does not depend on the force of the blow and the speed of the hammer. Used in car body repairs and works with a thin tin. With a conventional hammer has little in common - it is a complex system of vacuum suction cups, hooks, sleeves and other parts that interact with each other according to a rather complicated pattern. From a very practical device that notifies the owner of the arrival of guests, the door knocker, known since the times of Ancient China, has turned into an exquisite accessory that is used more for decoration. It is a wooden beater of the original form, mounted on a cord or hinge on the front door. A wooden tool designed to attract the attention of the audience and notify you about the completion of a certain stage of justice or sales. 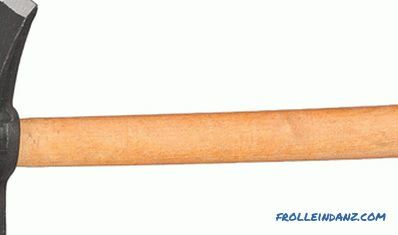 In appearance, it is somewhat reminiscent of a mallet, but there are also very unusual products that provide genuine works of art. A medical instrument for determining various nerve pathology search reactions. It is made of stainless steel and equipped with rubber or polymeric tips on both sides of the symmetrical head. Sometimes it is completed with a neurological needle hidden in the handle. Used for striking a surgical chisel or dental instrument. It is made of stainless medical steel, cast iron, brass, equipped with polymer linings to reduce noise from impact. Practically for each specialty and a field of activity where shock impacts are assumed, its own types and varieties of hammers are developed. 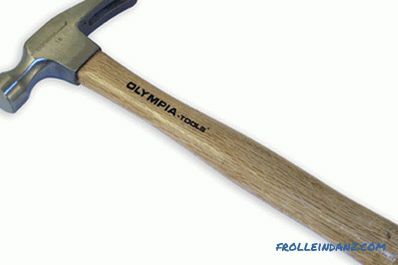 In addition to the variety of shapes and sizes of the head part, hammers are also distinguished by handles. 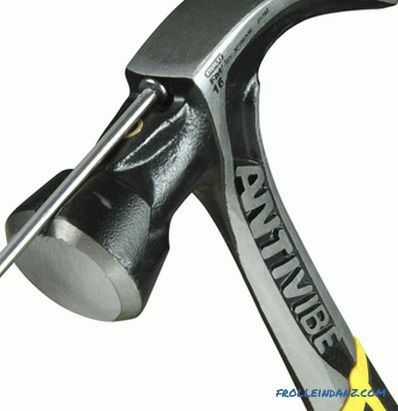 This part of the tool plays an equally important role in its functionality, determining not only the impact force and speed, but also the level of fatigue of the person working with a hammer, the safety of using the tool and its durability. Exotic types of hammers and hammers can be made of mahogany and other valuable species. 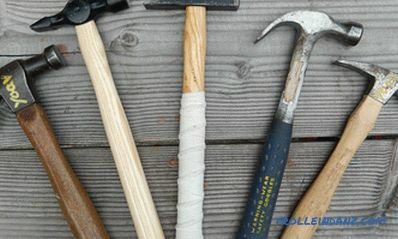 Many modern tools are equipped with handles of various types of polymers, fiberglass, even all-metal. They are certainly equipped with vibration-damping pads of soft rubber or rubber, reducing the recoil force and increasing the friction between the hands of the worker and the handle. A feature of the hammer is that the maximum part of its mass must be concentrated in the area of ​​the head part - in this case its speed will be maximum with a minimum of applied effort. 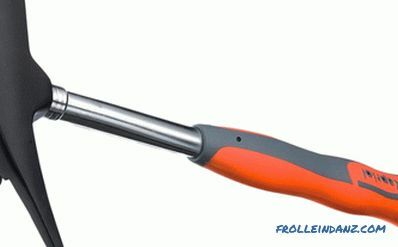 The optimum ratio of the strength of the handle and its weight - the main requirement in the production of a hammer of any kind.